The new MCAT (2015 MCAT) is by far the most intensive and extensive test of the undergraduate career. The good news is that a few months of focused study will give you the basic tools to handle even the most complicated looking questions. I just recently finished the MCAT journey in May 2016, and wanted to write this as an informal guide to help future test takers. Additionally, for anyone out there with MCAT tips or questions, please post them below in the comments! Note: Some links in this post are affiliate links. This small income helps pay for hosting and design on the site, and it doesn't cost you anything. Finally, the study aids mentioned are ones I personally used to prepare for the MCAT . I ended up with a 517 on the test, which certainly isn’t wizard-level like a 525, but I think the techniques I used helped me greatly in getting this score despite forgetting much of the basic sciences from early undergrad. Here’s my score breakdown on the real MCAT and the AAMC Practice Test. Typically people score slightly higher on the actual test compared to the AAMC practice test, but this just goes to show that things are variable and anything can happen. Despite the drop in some section scores I can say it feels awesome to know that I really put my all into this test, so there aren't any regrets. First off, acquaint yourself with the basics of the MCAT. I ended up studying 5 days a week for around 10 weeks in the spring. I aimed to study for 7 hours per day, but usually hovered around 5-6 hours of solid study time (about 250 - 300 hours total). It seems like most people consider 2-3 months of uninterrupted study to be adequate, but this timeline may need to be extended if full-time studying isn’t possible due to school obligations or another job. I’ve also heard of people prepping for 6+ months doing just a bit of work everyday, but I’d be careful with this as you’re more likely to forget material learned earlier in the studying if it isn’t reviewed frequently. It’s optimal to take as many practice tests as possible (more than 8), since learning the style of questions and timing of the test is arguably more important than pure content review. I aimed to take one practice test per week and spend the day after reviewing it carefully to correct any errors in logic while making notes of concepts that I was weak in. My school offered a Princeton Review Prep Course for a nominal fee, and it was a great opportunity to get their study materials for a low price. The actual classroom portion wasn't the most efficient use of time for me as it is hard to balance the needs of 20+ students during specific content review, and I found that self studying allowed me to tailor my study time to be most effective. I’m a fairly motivated student though, and the class structure may help some students stay on schedule in content review. Since I did the Princeton Review class I exclusively used their 2016 edition MCAT set for content review. The books are incredibly thorough, and it would be nearly impossible to remember all their content. Know that their Physics book is slightly outdated and still contains a lot of classical physics which isn’t tested much, if at all, on the new MCAT. Their Biochemistry and Organic Chemistry books were concise and great for review if you have taken those courses before. As a biology major I didn't glance in the Biology book much. Finally, their Psychology book was a great resource and gave me enough knowledge to at least make a very informed guess on everything on the real test. Access to the 10+ Princeton Review (TPR) practice tests was invaluable. Having this many tests allowed me to take one per week and tailor my content review to the style and demands of the test. In my opinion taking practice tests is by far the most important aspect of MCAT preparation. All of the content review in the world means nothing if you don’t have the tools to apply it to the passages on the test. I was also much more motivated to study by reviewing errors on practice tests rather than just reading chapters of books. This method is effective as long as you take enough practice tests to gain a wide breadth of knowledge. I will note that the TPR tests were a little heavy on classical physics and light on biochemistry and amino acids, so this is something to take into account when studying. Finally, I had access to the AAMC Section Banks, Sample Test, and Practice Test which were crucial for dialing in test taking strategies and filling in any previous knowledge area gaps. A full list of AAMC practice materials may be found on their website: Practice for the MCAT Exam. I would highly recommend their Practice Tests, Section Bank, and Official Guide. The Question Packs are a little outdated as they were compiled from older AAMC tests and therefore aren't as representative of the current MCAT. Flashcards are a great tool to help remember concepts and equations that come up often. I made approximately 2,000 cards during the course of my studying, which would be insanely hard to physically manage and organize. Luckily Anki is a fantastic multi-platform flashcard application that presents cards at certain intervals based on how well you knew them in the past. This spaced repetition model is much more effective than traditional applications like Quizlet, and I’d highly suggest using Anki routinely throughout the study process. Anki isn’t the prettiest application, but there are a number of tutorials on YouTube which give the basics. I took handwritten notes on the science sections that I read, but never really referred back to them. I think they helped me synthesize information at the time, but I’ve also read of people doing content review without taking notes along the way. Finally, I took notes on my computer of all the bolded terms in the TPR Psychology book. This was awesome as I went through the whole book in a week and then was able to copy and paste terms & definitions into Anki for future review. The notes ended up taking around 26 pages. Here’s a link to a PDF of the notes if anyone finds it useful. I found that consistently going to the same location, like a library, to study was most the most effective use of time. This made me treat studying like a 9 to 5 job, and I would often get sidetracked if I studied at home, so the 15 minutes to get to the library was well worth it in the long run. There are also a couple things for the test that you’re just going to have to memorize from the start. 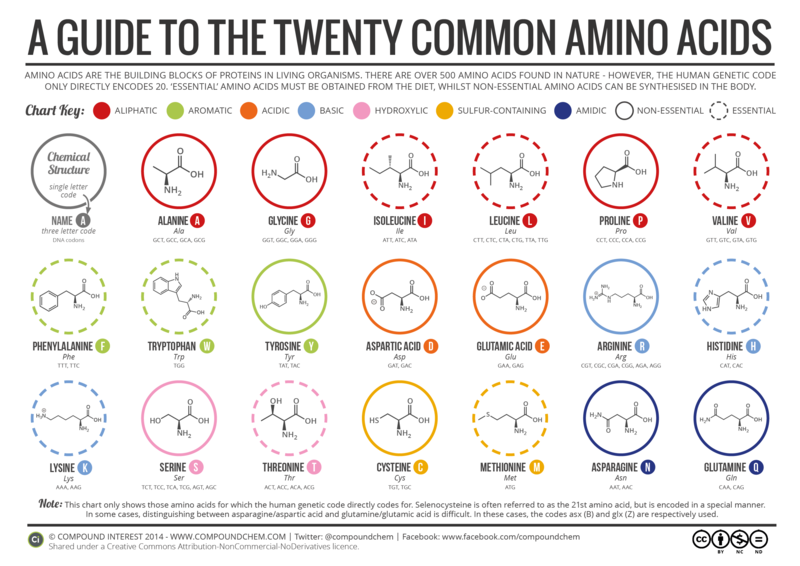 Amino acids are at the top of this list. Know their structures, three letter abbreviations, symbols, groupings (polar, nonpolar, acidic, etc), and relevant sidechain pKas. Here’s a good reference sheet. I memorized these early on, and wrote the amino acids down from memory during the tutorial before each practice test. After doing that 10 times I knew them inside and out. I’d also suggest doing this routine with metric prefixes, symbols, and their scientific notation if you aren’t super strong with those. The MCAT makes you question everything - what you’ve done so far, your self worth, your intelligence, and there’s lots of reflection on earlier school years. Practice tests can very easily bring you up or down, but what it comes down to is that your emotions are tied to a simple number once a week. The sheer amount of time put into studying for something like this makes you a little bit obsessed with numbers/results, and sometimes this results in forgetting the bigger picture. Make sure to remind yourself that this test doesn’t define your self-worth, and maintain good balance while studying - exercising, eating well, etc. Also don’t be discouraged by a bad practice test - oftentimes they result from being a little burnt out. Taking a couple days to relax and refocus can quickly bring you back on track. Practice tests should have an overall upward trend in scores, but be aware that practice test scoring scales vary wildly between companies, and it is typical to get a much lower score on those tests compared to the real thing. For reference, my highest score on a TPR practice test was 510 and I got a 519 on the AAMC Scored and 517 on the real thing. The key is to come into test day well rested and confident in your skills, so I wouldn’t suggest cramming down to the last minute. Ideally you took the AAMC Scored a few days before the real thing as the score on that test will likely be +/- 2 points from your real MCAT, and it will give you a confidence boost before the real thing. Those practice test numbers are real, and there’s a reason you did well! Believe it. I took the AAMC Scored two weeks before the test and feel like I burned out a good bit between then and the real test, so save it for closer to the test date if possible. Continue some light review if you want, but ideally you’ll save the last two days to have fun, relax, and think about all the fun things you’ll do after this saga is over. The morning of test day I took a light jog to let off some stress, did some quick meditation, and then made sure to be at the test center by 7:30 AM since the registration takes a good bit of time. Try to keep things like food consistent between your practice tests and the real thing - test day isn’t the time to experiment with caffeine pills or new foods. Once registration is over you’ll be called in and seated at your testing station. You have 8 minutes to read the examination agreement and another 10 minutes during the tutorial to orient yourself, get comfortable with the space, and jot down some pre-exam notes in the booklet the testing center provides. I’ve read of some testing centers not allowing writing during the examination agreement, but there should be no issues doing this during the exam tutorial. Taking this bit of time to relax will allow you to dive right into the Chem/Phys section once it begins. Also, bring earplugs if those work for you. Most test centers have earmuffs or noise-canceling headphones, but it pays to come prepared for anything. You’re going to feel totally spent after taking the MCAT, and that’s the way it should be. It’s a really long test, and you’re giving it all the brainpower you have. I walked out of the testing center knowing that things went fairly well, but had a weird mix of emotions - the type where your body doesn’t really know what it wants. I was happy to be done, but also exhausted, and could barely muster the energy to call a couple people after the test. Nonetheless, there’s a huge sense of freedom when you walk out knowing that the MCAT journey is done! My post-test advice? Forget about it for a while. Don’t get hung up thinking about questions that you may have gotten wrong or start to doubt your abilities. You’ve done your job, and nothing is going to change your results, so it’s pointless to stress over the test anymore. The MCAT Reddit page also has fantastic test score datasets that you can use to help predict your exam score and gauge progress. This compilation of exam scores contains scoring data for the real MCAT, both AAMC practice tests, and practice tests from other companies such as Kaplan and TPR. Keep in mind that these scores don’t indicate when in the study process the tests were done, so take everything with a grain of salt. Additionally, some Reddit users have made score prediction equations from this data, and it’s always worth passing some numbers by them to see how your practice tests stack up to the real thing. Reddit user exlibrisadpugno has some pretty accurate predictions, and you can find that page here: MCAT Prediction Equations. Note that students who post scores on the MCAT Reddit page are a highly self-selecting population with scores much higher than the average. You’ll see a lot of 520+ scores being discussed, so don’t get down thinking that you’re not up to par with everyone else. The national average for this exam is a 500. Also remember that the practice tests from other companies typically give a lower score than what you’ll get on the actual test, but you’ll quickly figure this out by browsing through the data. Finally, you’ll also find interesting threads with reactions from test day for all exams as well as reactions upon score release. Countless other MCAT topics are discussed on the site, so explore around and have fun reading! This is a big test, so don’t underestimate it, but know that if you thoroughly understand the material and put in the time you’ll do well. Most of all, believe in yourself. You’re smart, self-motivated, and you will be a doctor. This test is about confidence, and you have it. Good luck! Did I miss something you were wondering about? Post questions in the comments and I’ll do my best to address them and add that material to the article.